ODC Design were engaged by Intelematics Australia, a company owned by RACV for fitout services of their new three level Melbourne head office located in the CBD and completed in 2017. Level 3 is shared by the Traffic Control department with the remaining half of the space dedicated to an open plan workstation area, offices, meeting rooms and tea room. Level 4 is assigned to workstation areas, offices, meeting rooms, breakout area and bathroom amenities. 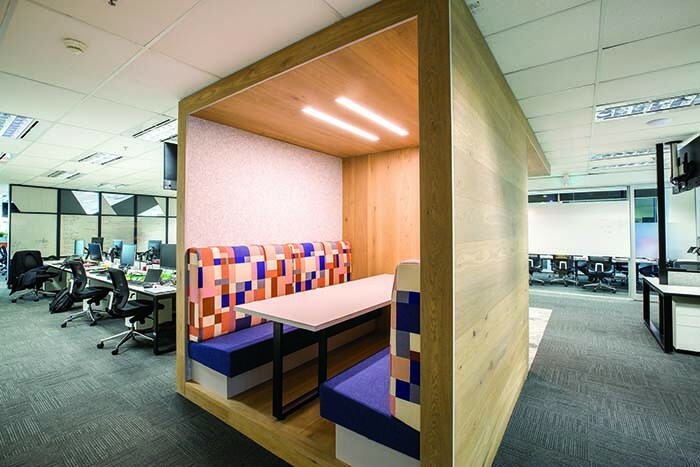 The breakout area on this level consists of a small kitchen, bench table and seating, also offering alternative workspace in the form of stylish open pods. Each level features flexible magnetic whiteboard panelling centred in the open plan setting, which also acts as a division. TV monitors are allocated to every workstation with a multi-screen wall configured on Level 3. Level 5 comprises workstations and a large breakout area that accommodates the entire front section of the floor. The breakout area includes a fully functional kitchen, large dining table with high stools and upholstered seating including a modular lounge. The welcoming array of the soft colour contrast and city street views provides for an enjoyable flexible workplace environment for reflection, collaboration or a place to relax.